Last weekend I attended an author event at my local yarn shop. 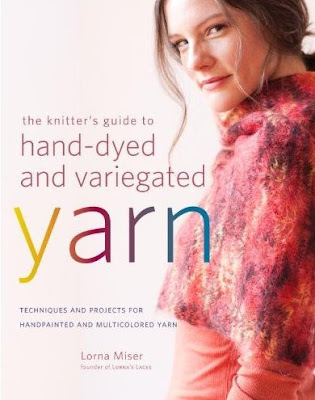 Lorna Miser, founder of Lorna's Laces, gave a talk about her book, The Knitter's Guide to Hand Dyed and Variegated Yarn. The book is filled with techniques and projects for multicolored yarn, including many new stitches I have never run across before. I probably wouldn't have paid much attention to this book if I hadn't attended the talk because I didn't realize how much there is to know on the subject of working with variegated yarn. It was fascinating to hear about the different methods for making certain colors pop, preventing pooling, and selecting the best lace patterns for specific types of colorways. Lorna talked about each chapter in the book and showed us the gorgeous knit samples used in the photographs. (I wanted to tuck more than one item in my purse and quietly walk out the door with it.) 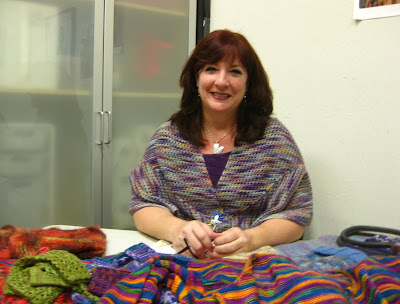 She gave us tips on patterns, stitches, and techniques that make the best use of variegated colors. I was completely inspired and couldn't wait to get home and start knitting. -She founded Lorna's Laces and raised it like a child until it grew to the point that it needed more than she could give. She sold it in 2003 and went to Scotland to recover from exhaustion. -She now designs knitting patterns for many companies, such as Fiesta, Red Heart, Lorna's Laces, and more, and says you can support yourself doing that. 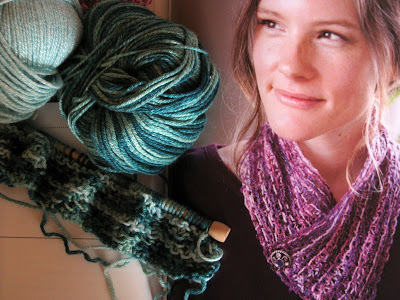 -On a skein of variegated yarn, the longer the section of color, the more opportunity for pooling. She recommends untwisting a skein before you buy it to look at the dominate color and check out the length of the sections of color. -Adding bobbles to an item (like the cute mittens in her book) can help prevent color pooling. -When knitting Fair Isle, to prevent puckering, first drink a glass of wine. -Seed stitch can add weight to lighter yarns. I'm currently knitting this neck cozy from Lorna's book using a stitch called Webbed Float Stitch with alternating strands of variegated and solid colored yarn. Next I want to knit a pair of lacy silk fingerless gloves. Next month is Stitches West! I'm attending a class on designing with lace and can't wait. OOOOoooo I'm envious! It sounds like a great event! How cool to meet the real Lorna. My favorite tip is the wine one, but the bobbles suggestion is probably more useful! Those yarns look so beautiful. 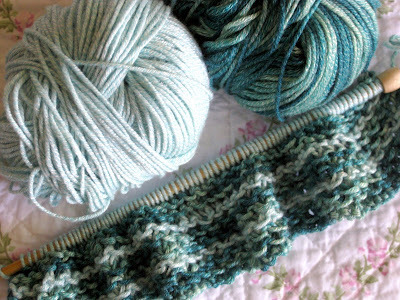 I need to check out the Webbed Float Stitch; it looks very pretty. I hope you post a picture of your neck cozy when you are finished. I love yarn... sigh, if I only knew how to use it:) Sounds like a wonderful event! Love the neck cozy, can't wait to see it when you finish! Wow, dear girlfriend you are really doing wonders with your knitting needles! Looks like a great book and fun to hear the author chat about each chapter. Seems you've come a way with more hints and tips, thanks for sharing with us. So cool! I love her yarns and the class you're going to take sounds great. Can't wait to hear about it. Sounds like an informative talk. I will have to take a look for her book. Thanks for sharing some of her tips! How cool! Love what you learned, too. I have not used may variegated yarns. Love the wine tip, too! I don't need an excuse to do that! Oh, that sounds so cool! I love Lorna's Laces yarn -- I was just thinking this morning that my LL socks have held up better than other yarns. I don't love that they pool so much though -- I sure wish I'd heard her tips to prevent pooling. I don't think I'd want bobbles on my socks LOL! So pretty! I have a friend that attends Stitches East. It's been held in my state the last 2 years. just to let you know, i have commented on a couple of your older posts too. don't know if people check this (i do).